Find your quiz result below and learn more about your personal style by matching your percentage with the corresponding score range listed below. While coastal style can vary greatly, a transitional coastal style is a bit more refined while still allowing you to feel as if you could walk outside and into the sand any minute, even if you are hundreds of miles inland. A transitional coastal style relies on sun-soaked rooms, large windows and breezy but durable fabrics. The hallmark to creating these light filled rooms is the use of white paint and fabrics. Vary shades of blue and other light-colored cool neutrals add to the color scheme, while warmth is added using raw natural materials like seagrass and jute. The furniture chosen for this style is durable and sturdy, but certainly not boring. You feel comfortable and inspired in light breezy spaces, have an undying love for all things linen and jute, and a love of the water. Feeling the sand between your toes and the breeze rolling off the water is likely where you feel the most joy and peace. You like your home to feel clean and comfortable and that makes your home design style decidedly coastal. Although this style does by many names, it is most often referred to as “modern farmhouse” and this style is all about juxtaposition. Light and dark, soft and rough, worn and refined are all necessary to pull off this popular design style that is the perfect combination of highly functional and purpose driven décor with a comfortable and casual aesthetic. Home furnishings are carefully chosen and often appear to be “found” more than purchased from a store. This style can become a bit cluttered if you’re not careful, but when done right it is beautiful, simple and comfortable. Seeing the potential in unexpected ways is probably one of your many talents. Your style relies on your functional sensibilities because just like on a farm, the furnishings used in your farmhouse décor should have an obvious purpose and the focus should be on comfort and function. Farmhouse style can be chic, but it should always be casual and welcoming. This style is the perfect pairing between traditional elegance and modern aesthetic. It features neutral color palettes, clean lines and minimal but impactful accessories. This style is classic and doesn’t rely on the latest trends for inspiration, but instead focuses on curating a timeless look. Although some may say this style can be a little boring, you show your personality with carefully chosen accents and artwork. Comfort is important to you and you prefer an uncluttered and relaxing home. You are not distracted by the hottest trends, instead you prefer a more timeless look. Your wardrobe probably reflects this style too, featuring classic silhouettes and neutral colors. Maintaining an elegant style is important to you but not so much as to compromise a comfortable place to put your feet up and unwind with a glass of wine at the end of the day. A transitional or modern glam style is utterly feminine. Although there are many variations of this style, a modern or transitional glam approach reads as sophisticated but with a vibrant personality. While it is often based in neutrals, bold prints and the whole spectrum of pink are common design elements. This style thrives on metallic accents and warm textured fabrics like fur. Glam style is unapologetic but still elegant. You have a strong sense of style and know exactly what you like. You revel in your femininity and enjoy being surrounded by glamorous and luxe textures and décor. If it’s not pretty, then it has no place in your home. At the end of the day, there is nothing better than kicking off your high heels, mixing your favorite cocktail and kicking back. The urban rustic look is edgy and relies heavily on texture to pull the design together. 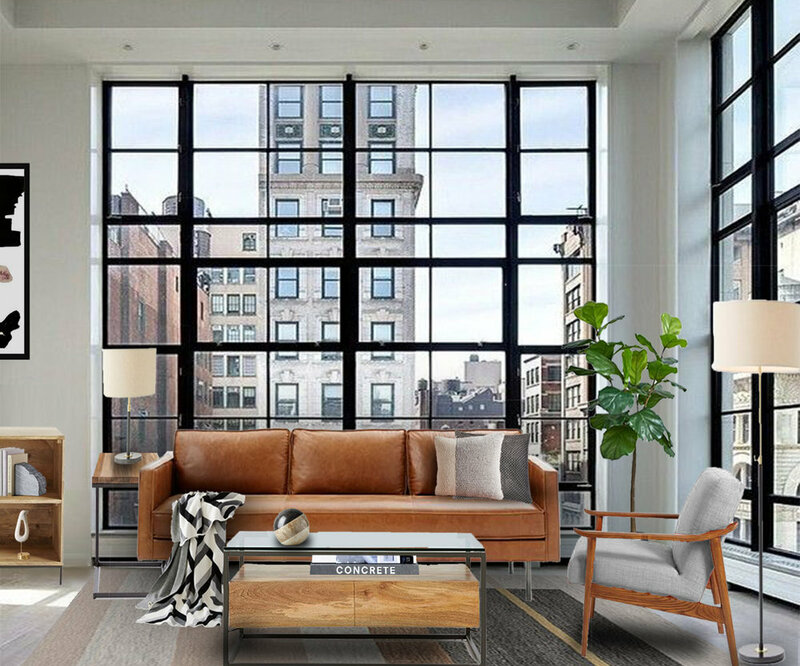 It is similar to other styles that pair the new with the old, however urban rustic style brings textures like exposed brick, raw wood and leather to the forefront of the design. It features heavy use of industrial accents and the furniture is often characterized by raw materials with modern shapes. When you walk into a room your first instinct is to touch everything. You love the richness of robust textures and scents, like leather, coffee and bourbon. You are drawn to the idea of living in a refurbished building like an old factory. You often find yourself equally drawn to opposites like nature and the city or clean modern lines and old reclaimed wood furniture. Urban rustic is the perfect pairing to complement your style and personality.